Mr. Do! consists of ten different dirt arrangements or stages. Each of these ten different stage arrangements has 4 different predetermined apple positions, for a total possibility of 40 different stages. As you go from scene 1 to scene 10, you will be presented with a new stage until scene 11, when the cycle of stages will repeat itself. After any stage that ends in a 3, 6, and 9, you are provided with a status screen, indicating your progress through the game, and how each stage was completed. After any stage that ends with a 0, you are given a more comprehensive status screen which indicates your current play averages. A cherry indicates that the stage was completed by collecting every cherry. A monster indicates that the stage was completed by destroying every monster. An Alphamonster indicates that the stage was completed by spelling out EXTRA and earning a free life, and a diamond indicates that the stage was completed by collecting a diamond from a fallen apple. After Scene 10, the rounds will loop with a different color scheme, the colors will repeat on Scene 31. Killing all of the monsters is the best way to complete a scene, unless you can get a diamond or the last letter in EXTRA. Use the apples to get maximum points, then get the bonus prize when you have one or two monsters left. At higher levels though, the game becomes chaotic quickly, and there is little time to worry about finishing a level one way or the other. Save the power ball as a last chance weapon. Since the apples can be dropped one level safely, Mr. Do can set up little traps for the monsters. Dig straight up the column next to an apple, drop the apple one level and hide behind it. Push the apple so it hangs out over the open pathway. Wait for the monsters to come up underneath the apple. When one of them turns into a striped creature, push the apple on top of them and dig to another apple. This works pretty well in earlier scenes, but later on, when monsters dig from the start of the level, it is difficult to rely upon. Unlike the monsters in Dig Dug, monsters on whom an apple is falling tend to panic, running back and forth and making it more likely for them to be hit. Falling apples break when they hit solid ground, but will fall through thin earth. 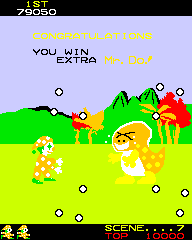 Learning to use the powerball skillfully is an important step in mastering Mr. Do. When used at the end of a long straightaway without any branches it works quite predictably, but corners or branches add a random element to its travel. The powerball always travels "down", relative Mr. Do's orientation, when released, so throwing it when standing over a shaft will cause it to always head down. The more times the powerball is thrown, the longer it'll take to recharge after it kills a monster. A kill after the first throw regenerates immediately, but as you throw the ball more times the delay gets longer and longer. Collecting the prize that appears once all the dinos are in play resets the ball's recharge delay, which can make it easy to mop up the remaining dinos while they are frozen. When Mr. Do digs a passage, there's actually a bit of a black border around his image that makes it look like he's dug a pixel or two farther than he really has. The game considers the ball's release point to be where it's visible on Do's sprite, which is a little ahead of his real location. Because of this, you can actually launch the ball through thin walls if you're slightly covering them. When the Alphamonster appears after collecting the prize, his entourage tends to chase Mr. Do directly while the Alphamonster himself stays away, but shooting the ball through a wall can be used to kill him easily. On the later scenes, don't wait for the monsters. The striped ones will sometimes dig under the apples and kill themselves. Later on the monsters move so quickly that you must take advantage of all your methods of finishing levels to make it. Earning extra lives is the only way to stay in the game, so it's important to know how to hunt down Alphamonsters with as little danger to yourself as possible. Know which letters you need (these are the white, non-highlighted letters), and how far away you are from your next multiple of 5000 points. If you earn your next 5000 point multiple while clearing a stage, the Alphamonster will come out at the beginning of the next stage. E and A come out less frequently than the other three letters. The Alphamonster will chase you when you're not holding a power ball, and run away from you when you are. Don't give up your power ball to shoot an Alphamonster if it means being defenseless against a nearby crowd of monsters. However, if the Alphamonster you're about to shoot is the last one, you may safely disregard the monsters since the stage will end as soon as you kill the Alphamonster. It is difficult to kill an Alphamonster with an apple, since they will usually turn to face the apple and eat it, but it is possible. This page was last edited on 19 December 2010, at 21:32.